Join our eclub for FUN CONTESTS, monthly insider information, coupons & MORE! Enjoy a FREE, autographed, print edition of the 224-page SAN DIEGAN when you join our eclub! 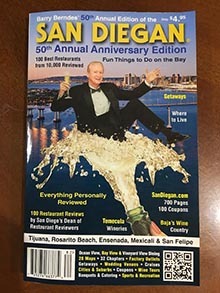 The SAN DIEGAN is sold in major supermarkets & newsstands countywide for $4.95, but an autographed copy is priceless! WINNING IS FUN & EASY: Just keep your smart phone handy for our FUN monthly photo & video contests showcasing the BEST OF SAN DIEGO! Our monthly contests will be announced to our members monthly via email. You’ll be having fun snapping photos and videos with your phone to enter via contest rules and theme. Winning photo or video will be a featured post on both our Facebook page and the SAN DIEGAN website’s eclub community page! 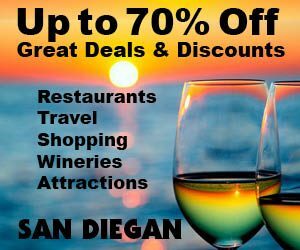 Be part of our community and share what’s amazing about San Diego! Members will also receive our popular monthly newsletter highlighting a special region’s annual events celebrated during the month with insider information of where to eat, where to stay and what to do. We’re celebrating 50 years in business as the #1 online and print local and regional publication. So we have San Diego and the region at our fingertips! With over 5 million copies in print and followed by a whopping 21 million people annually, we are a reliable and highly sought after resource. Our greatest appeal is we personally review EVERYTHING we recommend! To insure accuracy we pay for our own meals and inspect the kitchens. So our recommendations are spot on! Lucky contest winners will receive FREE meals, staying in romantic resort getaways, enjoy delicious wines! You’ll get FREE tickets to seasonal events and live theatre performances! You’ll be enjoying FREE recreational freebies including FREE surfboard lessons and FREE La Jolla Shores kayaking. We treat our winners like royalty by rewarding them with the same places we experienced! FREE Hotel Stay in Tijuana.